For hundreds of years, aurora sightings have left people intrigued – for both their beauty and unpredictability. In any moment, they can surprise us as bright flashes of light in the night sky, dark above us. They appear like unexpected gifts, made of colorful swaths of light, dancing above us. In a dance that sometimes looks more like a wave. As if to say – hello! These beautiful displays of light are are born of the interaction between nitrogen and oxygen atoms in Earth’s atmosphere and incoming charged particles previously trapped in the area of space around our atmosphere called our magnetosphere. This interaction excites the atoms for a moment and as they settle back into their normal states, they release highly energized photons, or light particles. We see these photons in mesmerizing displays of light we call aurora. Geomagnetic storms, which can energize the magnetosphere with large amounts of charged particles, directly impact the creation and appearance of aurora. We aren’t yet able to reliably and accurately predict space weather disturbances like geomagnetic storms. Although we can’t yet fully predict space weather events that trigger aurora, we do have some aurora prediction models that use measures or, more often, estimates of the disturbances in the Earth’s magnetic field. These disturbances, which are the result of events such as geomagnetic storms, help us detect space weather events that can disturb Earth’s magnetosphere, and sometimes our atmosphere, in ways that can create aurora. Detecting these events gives us some warning that aurora may appear, but they can only make general estimates as to where aurora might appear, not specifically where they will. They are also based on averages for large areas of Earth’s surface and because of this, are not very precise. We published an open access paper recently on a hybrid aurora alert system that combines these aurora prediction models with real-time sightings reported by Aurorasaurus citizen scientists across the world. Three members of our team authored the paper, published in Earth and Space Science, an American Geophysical Union publication, earlier this month: Nathan Case, one of our project’s former post doctorate fellows; David Kingman our lead developer; and, Aurorasaurus founder, Liz MacDonald. The paper highlights Aurorasaurus’ hybrid nowcasting system, which has been collecting data since November of 2014 and has already led to some useful scientific contributions to aurora science. For instance, there have been enough data from citizen science reports of aurora sightings in areas outside of where scientists previously thought aurora could be seen that the aurora view line has changed. The aurora ‘view line’ in both the Northern and Southern hemispheres are more equatorward than they used be because of Aurorasaurus data. Equatorward is used to indicate how close the lines are to the equator from the North and South Poles – the closer you are to both, aurora are more and more predominately seen. If it wasn’t for our many citizen scientist reports from Aurorasaurus users like you, this adaptation wouldn’t have happened! This is data taken from February 3rd of this year, showing a positive cluster of aurora sightings triangulated in blue. The black line indicated where the view line would have been had there been no data reported. the red line incorporates how the view line adapts to the cluster of positive sightings. The data is also helping in other important ways. Because the citizen scientist reports of aurora provide more localized, real-time information of where aurora are, they are also helpful in learning more about the conditions around aurora sightings themselves. For instance, Aurorasaurus users can report both positive and negative sightings. Negative sightings are helpful in informing us where cloud cover or light pollution may be obstructing the view of the aurora. This is helpful in developing prediction and forecasting models. 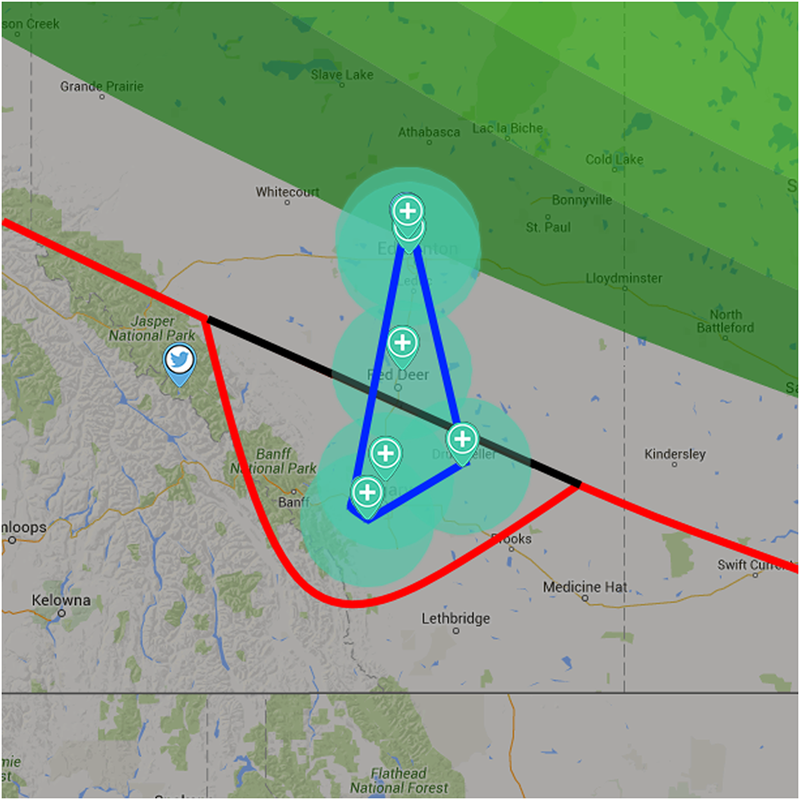 Aurorasaurus’ aurora alert system is also affecting the science of observing aurora. It’s a two-tier aurora alert system with the first level alert issued to registered users whose profile location is within an area where at least three reports of aurora have been collected over a 90 minute period. An area with at least three reports is called a positive cluster, in Aurorasaurus terms. A level two alert is issued to any registered users poleward of the view line of that aurora sighting report. So far, the system has issued over 100,000 alerts of auroral visibility, including nearly 200 highly localized alerts, to over 2000 citizen scientists users. The system will continue to be tested for accuracy and ways to improve and we’re looking forward to seeing how it evolves. You can read onfrom the paper on the system and Aurorasaurus science here. Also, check it out for more details on our unique algorithmic implementation of the alerts and clustering spatial data mining – a technique we believe is used for the first time to help nowcast auroral visibility. Aurora prediction and forecasting provides us with information on when and where to see these phenomenal events, when and where we can witness their beauty. And, because the presence of aurora themselves indicate an influx of charged particles into our atmosphere, observing and documenting their appearances can help us in understanding more about more impactful space weather events coming our way. Large geomagnetic disturbances that can affect the functionality our communications systems and power grids so predicting their arrival can help us out in some pretty important ways, too. We may develop a system that can predict when and where aurora will occur, and if we do, I think aurora will continue to intrigue us. We will still stand in awe, looking at the beauty of the colors. They will continue to appear in a moment, staying long enough to dance for a while above us. And as they leave, the dance may look more like waving. Because while disappearing, they may also be saying goodnight. Are you an aurora-enthusiast? Perhaps you are an Aurorasaurus user and have received an alert? Do you like alerts or do you have your own way of forecasting aurora? We’d love to hear from you! Feel free to comment here, on this post, or shoot us an email at aurorasaurus.info@gmail.com. You can also find us on Facebook and Twitter to share your experiences with Aurorasaurus and/or forecasting aurora. Do you want to receive alerts of when aurora are in your area or when they might be? We’d love for you to join the project at www.aurorasaurus.org! Written by Aaluk Edwardson, a science writer and outreach coordinator with Aurorasaurus who also works in communications and outreach for the Heliophysics Division at the NASA HQ Office in Washington, D.C. This entry was posted in Getting Started with Aurorasaurus, Studies by Aurorasaurus. Bookmark the permalink. Some really excellent content on this internet site, appreciate it for contribution. Has anyone thought of using the information from each photo (date, location and time) to patch together a larger piece to collect information and create a picture?